You might be able to guess I’m going through my recent additions to my blog list. These two steam train pictures look so nice together I’m going to save myself some typing and blog them together. 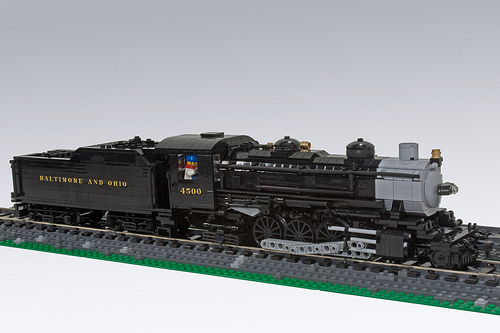 Both are excellent models and showcase the advantages of building trains at 8-wide. Which needs to be showcased since it is a dirty size. First we have Cale Leiphart‘s USRA Light Mikado from World War I as operated by the Baltimore and Ohio railway. Followed by this excellent diorama by Tony Sava (SaveTheAggie) from his series “The Texas Brick Railroad”. That’s a train-head joke. There’s joking banter between 6/7w builders and 8w builders that dates back many years. Great pics, and great models too. 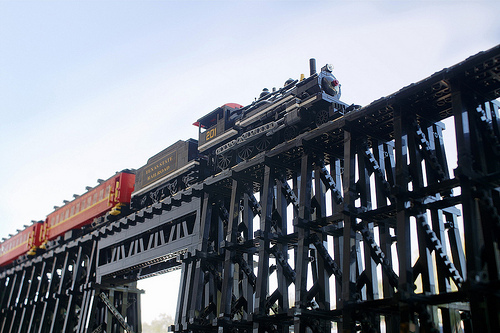 The only thing that detracts from these locos – and many/most other lego steam locos – is the studless technic beam as a connecting rod (I think that’s the term) attached to the drivers. I understand that it’s functional, but it doesn’t look good. Surely someone must be able to think of a better solution (and no, I can’t). ^ I agree with this although I think it’s by far the best compromise between looks and working. The studless technic is a bit fat. However to do proper running gear that both works and looks good is very, very difficult. You’re really pushing up against the limits of what you can do in pure LEGO. I’m unaware of a better solution in general cases. There are better (IMO) solutions using the old flex system but getting the parts is very difficult and expensive and may not always be appropriate. Personally I’ve been working for ages on using bars and clips but my solutions will all have issues with running for long periods. I suspect the ultimate solution would be a custom rod system with specially moulded parts. But I won’t hold my breath for it.